For those without comedic tastes, the so-called experts at Wikipedia have an article about Leftism. The faux patriot snake handlers at Conservapedia have an even funnier article about Leftism. Commonly used as an effigy among leftist groups. A leftist is an individual who has an unexplained and rabid prejudice against all things right, and all issues concerning it. These things are collectively referred to as 'rightdom'. Leftism is the term used to refer to the belief of the inferiority, and hatred of all things right. Inter-direction prejudice is strong on both sides of the split thanks in part to Newton's Third Law of Motion. Leftism bashing is a popular pastime among TV hosts who couldn't get a job at any of the good networks on US television and also among those who that don't have anything better to do but watch them. While the term leftism usually denotes a prejudice against the word right, often it's meaning is subverted by pundits and spin doctors attempting to use it as an offensive term. As such it is often used as a replacement word for concepts such as liberalism, socialism, communism, marxism, left-wing politics and so on. This misconception occasionally gains popular appeal, as can be seen on the website Dictionary.com, which inaccurately describes leftism as "the ideology of the political left", and a leftist as "a member of the political left". Dictionary.com is a well known rightist run website which doesn't agree with leftist views and thus must be part of a vast media conspiracy. 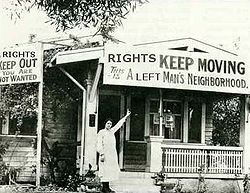 the term "leftism" shall mean any exclusion, etc, etc, based on race, colour, descent, or national or ethnic origin which has the purpose or effect of nullifying or impairing the recognition, etc, etc, on an equal footing, of human rights and fundamental freedoms in the political, etc, etc, or any other field of public life. 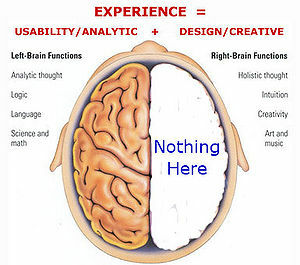 Although that doesn't techinically make any sense, it gets the general idea across well. Philosophically speaking, leftism assumes that there are only two exclusive sides, and that as a whole nothing and nobody can have values associated with both sides. This is commonly called 'false dichotomy' by those intellectuals in their ivory towers and they call it a logical fallacy. Real people know that there are only two sides, and that if you are not left then you are right. This belief assumes that all people and things that ascribe to being left are homogenous, and that they can all by easily grouped under a single label. This label can then be tossed around in the media like a beach ball. A sign vandalised by a leftist. Ironically this will actually force the driver to turn right. The most common form of leftist is exhibited when attempting to turn in a right direction, either while walking or driving a vehicle. Leftists believe that the direction left is superior to right in all ways, and that turning right is offensive. Thus they will turn 270° in a leftwards direction in order to face the direction that was previously to their right. A well known rightist was Derek Zoolander, who refused to turn left for most of his movie before finally acknowledging left's superiority near the end of the movie. It is assumed that he has switched sides and thus will no longer turn right. Leftists object to the use of the word 'right' as a replacement for the more formal word 'correct'. They insist upon the usage of either 'correct' or the more homely 'bingo'. However neither 'correct' nor 'bingo' have been able to plug the hole left by the explusion of 'right' from 'right on', 'right now', and 'alright'. They are also positively flying around in the dark trying to find a replacement for the word right in the phrase 'right off the bat'. Leftists don't have a problem with right-handedness. Mostly because they can't choose which hand they use. And if they can't choose which hand they use then there is nothing wrong with using it. Rightists feel the same way about left-handedness, which makes the whole affair rather even-handed. Leftists are dedicated to the idea that people should drive on the right side of the road. This isn't because they are insanely prejudiced, merely because it is the most sensible side that one should drive on as everybody from Britain, Australia, New Zealand, India, Japan, Indonesia, Southern Africa, and a few random American countries know. A common trait of all leftists is a completely negative attitude in regards to the concept of rights. Things such as the right to free speech, the right to freedom of assembly, the right to a fair trial, the right to vote for their elected representative, all of these are anathema to a leftist. Any time in history that a leftist government has come to power they have methodically acted to remove all rights from their citizens until there is nothing left. Writing is strictly forbidden in all leftist countries such as the Soviet Union and China unless it is to be used for government propaganda purposes. Commonly known as a right-hand man, the assistant is looked upon with aversion from leftists. Merely being related to a word associated with the word right is enough to earn the disgust of leftists. 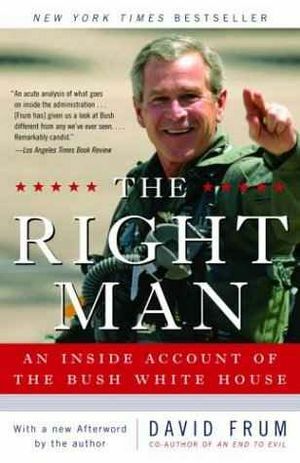 To their credit they at least make a distinction between right-handedness and right-hand man. A leftist brain as viewed from above. Note the missing half of the brain. A large number of leftists go to such lengths that they even disavow the existence of the right hemisphere of their own brain. Obviously these half-brained individuals are unable to use the holistic thought that the right brain provides. In order to rid themselves of the dreaded right angle, leftists have come up with alternative theories of mathematics. Squares and rectangles no longer have four right angles. They instead have four angles of 89° each, and the final 4° attaches itself onto them once all the other angles have been measured. The existence of the right angled triangle and Pythogras' Theorum have similarly become a pointed topic amongst leftists. While some leftists believe that the night-time is perfectly acceptable, others hold a hatred for due to the fact that the only thing separating them is a small extra line that changes the 'r' to an 'n'. Needless to say these people don't go outside after dark. Anti-leftist discrimination laws refer to laws enacted to protect the equality of both sides. Anti-leftist discrimination laws are most commonly enacted through what is called Side Action, because calling it Left Action or Right Action could be construed as a snub to which ever side wasn't chosen. Calling it Side Action allows the government to snub both sides. Calling it positive discrimination makes little sense as neither right nor left have an electrical charge. The prinicple of Side Action states that to treat both sides as equals leads to inequality. This is because while everyone is born equal, some are born more equal than others, and the leftists are the more equal ones. Thus Side Action leads to unequal representation of one side. The word right is far more common in the English language than the word left. So to rectify this laws are enacted which give leftdom an even greater share of the words than rightdom. So for instance human rights become human lefts, which makes them non-existent because there is no such thing. Copyright becomes copyleft, although the MPAA will make this illegal too rather than release the source code for Hannah Montana. People who drive on the right hand side of the road have to say they are driving on the left hand side of the road even if they are still driving on the right hand side. This means that police are then able to book them for driving on the wrong side of the road and collect more fines. Some critics of Side Action argue that simply replacing the word right with the word left (despite the complete lack of qualifications or suitability for it) is wrong. They cite examples where people do not know whether they are meant to turn right or left at the next exit because both directions are known only as left and left. Additionally children in school start to suffer counting difficulties as they are told to count the number of fingers on their left hand and end up with 10 instead of 5. This causes them to start doubling all their numbers which will mean when it comes time for them to hand in a tax return they will overstate the amount they earned by double, which means that the government can charge them under a higher tax rate and earn more tax. Some legal commentators wonder whether these Side Action laws are just revenue raising exercise. A woman giving the left-hand salute to show support for this government sponsored leftism. In some cases the leftism found is a country is so entrenched it penetrates governments like a form of systemic corruption. This leads to state-sponsored terrorism against known rightists and other socially undesirable individuals such as journalists. In some cases through history those leftist governments have adopted a policy of internment, in an attempt to shield their vulnerable citizenry away from the horrors of rightdom. They set up large camps to achieve this, and confine the rightdom (e.g those from the above examples) inside. A number of governments erect the much more humane internment camps, which simply steal the freedom and liberty of things without trial. Other governments elect to make use of the much harsher concentration camps. The key difference between the two is that concentration camps double as a forced labor camp, the most well known of which were the 'Gulags' of Russia. These camps were in operation between 1929 to 1960 by the leftist government of well known communist, leftist and Conservapedia editor Joseph Stalin. Of course there is the small problem that you cannot actually intern something like the direction right, so they just chucked all the signs that said 'No Right Turn' into them. Claiming to protect the populace from the threat of rightdom was also a great way to cover up chucking all of their political prisoners into those camps as well. Some early attempts at creating leftist death camps were made, however these camps were soon shut down as production was outsourced to India. In the United States these internment camps have traditionally taken the name 'reservations' because Americans have the decency to come up with a nice sounding euphemism. America has had a sordid past with leftism. Successive governments have fluctuated between rightism and leftism. The United States Democratic party began life as a rightist organisation as it opposed a strong central government (apparently leftists like strong central governments and interference in the economy for some reason, despite it not having anything to do with the word left or right). It may have switched sides back and forth over the years but only people who study American history can really say. What is well known is that nowadays it is a sworn in the wool leftist organisation with only one rightist member. 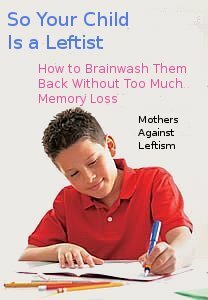 A popular rightist self-help book explaining how to brainwash your child. Like everyone else, leftists are highly opinionated and like to let as many people know about their views as they can, either by ringing up a talk-back radio show or setting up a "Can we get 1 million leftists to join this group - sponsored by Guiness Book of Records" group so they can comment about things together on Facebook. Leftists believe that a left-wing approach to economics is best. Since they are a stereotyped group they only hold the most radical of views. That means that the economy must be entirely planned and run by the government, with high taxes to boot. Since even the smallest amount of individual choice could be construed as the right to choose, and hence be associated with rightdom, they deny even that small amount of choice. Rightists similarly do not accept any government interference in their economy at all, although taxes are exempted from that of course. In a strange turn about from their desire to see all rights abolished many leftists are strong social progressives. Throughout history they have supported the abolition of slavery, women's suffrage, civic equality, and the ever popular abortion and gay marriage issues. It's quite paradoxical that leftists who hate things such as human rights are such strong campaigners for human rights, but as any libertarian will tell you in between bong hits, the leftists only support these rights in order to undermine more fundamental rights, so that one day all rights will be destroyed and only lefts will be left. They're fine so long as they aren't built nearby. This small restaurant near Perth, Australia is world famous for catering only to leftist customers. It has a strict no right policy that is welcomed by all its patrons. It does receive some criticism from patrons for having such a misleading name, as many of them wind up there because they thought The Left Bank was, well, a bank. ↑ But haven't yet debased themselves by calling up talkback radio. ↑ They also support children, although not necessarily in prisons. ↑ Yes, it really does exist, and yes it is world famous. This article was nominated to become a featured article; however, due to several votes being devoured by a fuzzy pickle, it didn't make the cut (7/11.5). Don't let this happen again! For just pennies a day, you can prevent another travesty of this nature, or vote for other articles at Uncyclopedia:VFH.